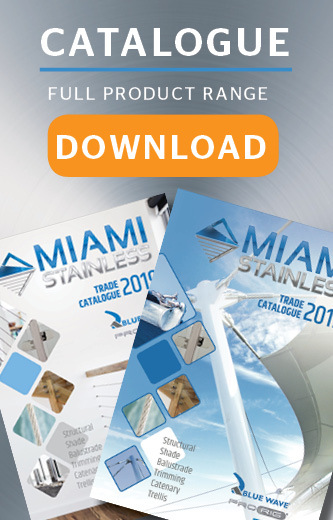 Miami Stainless Dee Ring Thimbles are available in both high quality AISI 316 marine grade stainless steel and AISI 304 grade stainless steel. Dee Ring Thimbles are generally sewn into the webbing of a shade sail corner to provide a secure fixing point. Miami Stainless Dee Ring Thimbles consist of a rolled thimble and welded ring and are available in the ultra high quality ProRig brand or the high quality Econ® brand. Dee Ring Thimble 6 x 30mm AISI 304 Miami Stainless Dee Ring Thimbles are available in both high ..
Dee Ring Thimble 6 x 50mm AISI 304 Miami Stainless Dee Ring Thimbles are available in both high ..
Dee Ring Thimble 6 x 50mm AISI 316 Miami Stainless Dee Ring Thimbles are available in both ..
Dee Ring Thimble 8 x 50mm AISI 304 Miami Stainless Dee Ring Thimbles are available in both high ..
Dee Ring Thimble 8 x 50mm AISI 316 Miami Stainless Dee Ring Thimbles are available in both high ..
Dee Ring Thimble 10 x 65mm AISI 304 Miami Stainless Dee Ring Thimbles are available in both high..